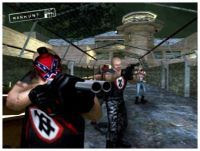 In the wake of an ongoing ratings controversy in the United States and a ban in Britain and Ireland, the game publisher Take Two Interactive Software Inc. has decided to temporarily suspend the release of the violent video game Manhunt 2, a sequel to its 2003 title Manhunt. The company has suspended the game distribution plans after the title faced bans by Britain and Ireland, as well as a ratings predicament in the United States due to its extremely violent content, which would have made it nearly impossible to buy in the country, the New York-based game publisher said Thursday in a statement. The decision by Take-Two Interactive Software Inc. to suspend distribution of the violent video game "Manhunt 2" could actually end up boosting demand from curious gamers, industry analysts said Friday. Analysts do not believe the move will harm the company's long-term bottom line. And if the game ever sees the light of day, the current controversy could give the title "a lot more exposure that would actually benefit game sales in the long run," said Colin Sebastian, senior research analyst at Lazard Capital Markets.